In light of the recent Decorex exhibition which received criticism for being ‘the same old stuff all over again,’ and the discontinuation of the Design Indaba expo earlier this year – the Jenny Mills team has been discussing alternatives that would be more successful. In Italy, design companies have ‘collaboration’ evenings – showcasing each other’s work and thereby creating a community with give & take, mutual benefits and recommendations. This could be fantastic if we consider it like ‘First Thursday’s, open up the doors, exhibit our work and serve craft food or showcase other local designers (which they could then, in turn, do for us) This way of networking becomes more accessible and is an experience rather than an event. 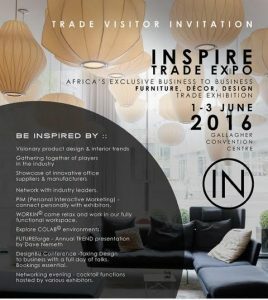 In the meantime, however, Jenny Mills is excited for the new furniture, decor and design event in Johannesburg called Inspire – as a trade only exhibit it will cater exclusively to designers – showcasing top quality, providing networking opportunities and inspiring with relevant, design related talks. It will be more business orientated than what we are proposing above but we believe it will be worth while… will keep you posted. Let us know on the website or on Facebook if you have any ideas and comments.